Join an Innovation Kickstart Group Today! Sign-up below to receive updates when group registration opens again! Unfulfillment in our work or relationships. Stuck in a ‘holding pattern’ … repeating patterns over and over again. Being passed over or pigeon-holed by others. Increasingly resistant to change & unable to adapt easily. Overwhelmed and stressed with challenges we’re facing. Working from our ‘left hand’ (i.e. outside of our strengths). The good news is that I believe most people and organizations want better … better with the world around them and better with themselves. The problem doesn’t lie in a lack of desire. It lies in a lack of direction and clarity – most people aren’t sure where to even begin. If they had a guide to help them know where to move and how, they would gladly jump on board and start to see their lives improve. They simply need a roadmap to innovation. The Innovation Kickstart Group provides a 3-month framework for innovative growth in your life by walking through the four lens of innovation in the context of a peer group, laying the foundation for healthy change. Having an innovative mindset requires us to not be satisfied with our surroundings. In order to make things better, you need a healthy disrespect for the way things are – not from a point of of cynicism, but from a foundation of “I can help”. The innovative spirit repeatedly feels as though ‘things could be better’ and wants to be a part of the change. What you will learn… How to identify & be a part of change around you; the difference between extrinsic & intrinsic barriers (and where they both fit within innovation). Having an innovative mindset requires us to also not be satisfied with ourselves. Complacency means being “pleased, especially with oneself or one’s merits, advantages, situation, etc., often without awareness of some potential danger or defect; self-satisfied” (Dictionary.com). You can’t be satisfied with leaving yourself the way you currently are. Innovation means letting go of an air of self-satisfaction, understanding that we can always grow and become better, coupled with the passion to do so. What you will learn… How to find & maintain momentum; embracing reality as your friend; how to create more space to innovate in your life. Although many times innovation can come through collaboration, change is hard to come by if we don’t believe we can affect change. In order to make a difference, you have to believe you can make a difference. Without inner confidence, we cannot begin to hope to change. Lack of belief can, at best, be a stalemate and, at worst, cause us to spiral in the opposite direction from where we want to be. What you will learn… How you’re ‘wired’ and how that has a profound influence in how you approach relationships, work & life, in general; how to have confident humility; how others around you provide added fuel for innovation (and, therefore, who you need by your side). In order to make innovation ‘sticky’ you must measure consistently. Innovation that isn’t measured won’t be maintained. It may feel as though progress is too incremental to truly gauge. The fact that progress is incremental many times is the very reason to measure it on a regular basis. Change can happen everyday, but it won’t feel like we’re making progress if we can’t look back and see the small steps that have led to great change over time. What you will learn… What & how often to measure progress; identifying patterns that both build and break innovation in your life. Once the foundation for growth has been laid, it’s time to put the wheels in motion! 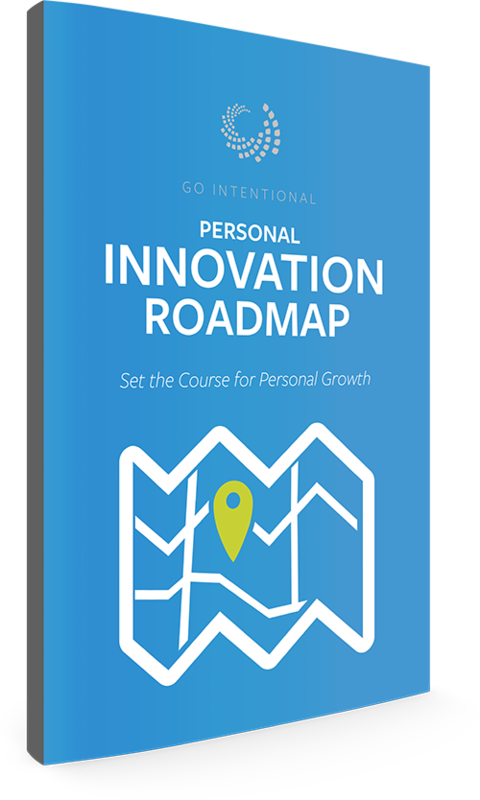 We’ll spend time at the conclusion of the group crafting your own Personal Innovation Roadmap containing immediate, mid-, and long-term innovation goals and steps to move forward in your life & work. This tool is something that companies pay us top dollar to have created for their teams and is only available as a part of a Kickstart Group. Your personalized Roadmap will help you set the course for growth ahead and begin to see impact immediately! Group registration for the current term is currently closed. New groups will begin soon, however. To receive information as new groups approach, please enter your name & email below. Thank you. Check your inbox to confirm. All coaching groups are backed by a 30-day money back guarantee. If for any reason you are not satisfied, simply let us know and we will refund your money. Online group calls occur one night per week and last one hour. All calls are recorded and posted securely each week for review or for those who miss a session. Members will have lifetime access to content.